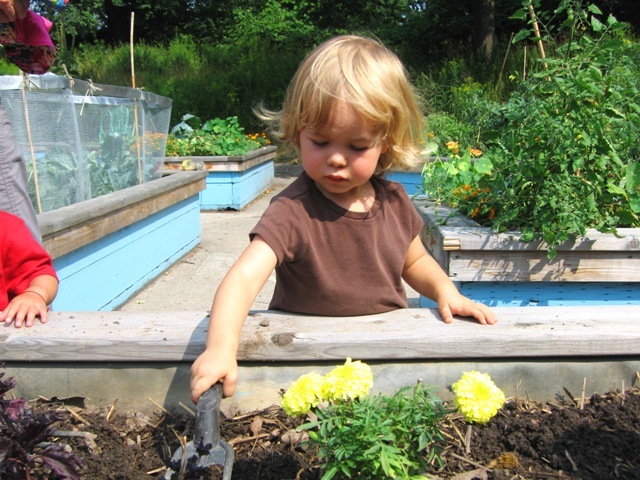 Free family drop-in program runs every Thursday from 10 am to noon, throughout July and August at the High Park Children’s Garden. Join us for gardening and composting activities, garden games, nature arts and crafts, storytelling and more! Open to children from 0 to 12 year-olds (older children are welcome as helpers/volunteers). No registration needed just stop by whenever you can! Parental/caregiver supervision is required. Hi! We’re new to Toronto. This drop-in sounds great! Could you tell me the start date in July? Thanks! Our Drop-In program starts the first Thursday in July – July 4th. We hope to see you there! We move to the area in August and look forward to joining you on one of the Thursdays. Thanks! Where exactly in the park is the High Park Children’s Garden please? Thank you! Hi! is your drop-in still on tomorrow, aug 29th? Thank you! Will you be doing the drop-in garden program for Summer 2016? Also, I was searching around on your site for a program that is specifically geared toward the garden and planting, outside of a march break or summer camp. Is there a program being offered in the Spring months (like a weekly thing), through the FUN Guide or elsewhere? My son is 4 and I was hoping to sign him up for something that would be garden / planting / growing focused! Otherwise, I guess the closest thing is this drop-in? Many thanks, I look forward to visiting either way. Hello and thank you for your interest in the Children’s Garden! We are running the Drop-In program on Thursday mornings again this July and Aug. It’s one of our favourite programs (as it lets us admin folk get out and play in the Garden too!). As for recurring weekly programs in the garden this is your best bet aside from our Camps and School Programs (if your little one is home schooled we might be able to put you in contact with a group that joins us quite often). Please note that the Children’s Garden is open to the public so you are welcome to stop by any time and have a visit. We hope to see you out there this season … there’s always something new to see and explore! I work at a child care centre and just wondering would I be able to bring my group to the drop-in program this summer? Thanks for your question! If it’s a small group (10 children plus adults) we can usually work things out. Unfortunately we cannot accommodate larger groups as we often have a large number of families attending the drop-in. There’s only so much space in the garden! We do, however, offer programs for groups throughout the summer. Please feel free to contact Keely at 416-392-1329 for more information. Are your summer camps fully booked and is there a waitlist? I have a 4 year old daughter and we are looking for the first week of August. Thanks! Our camps are fully booked for the summer. We do have waitlists … they’re fairly long but it never hurts to add your camper to the list. Call 416-338-4FUN (4386) or log onto toronto.ca/registration to add your camper’s name to the waitlist. You’ll find a chart with all of the necessary camp program barcodes on our Eco Camp Page. Thanks for your interest in Eco Camps! Hi – Where in the park is the garden located? And are some areas in shade or all in direct sun? Location is south end of the park, just north of Colborne Lodge Museum and about 5 to 10 minutes walking distance south of the Restaurant. Check out our About us page for a map of the park. Hope to see you at the Family Drop-In this summer! Hello! I noticed that this drop-in ends around lunch time. Will there be food served? Just wondering so I know whether to pack lunches for the kids when we drop by tomorrow. Lunch is not served but sometimes there is a little snack. You’re welcome to bring a lunch and picnic at the Garden or there’s always the restaurant in the centre of the park. Have fun! Hi, will you have the drop in program in the summer 2017 as well? Definitely! 🙂 Every Thursday morning from 10 am to Noon throughout July and August. It’s one of our favourite programs (it lets us office folks get out into the garden and play a little!). We look forward to seeing you there! Hi! Just wanted to enquire if your garden family drop in program is on tomorrow. Also, what are the timings for it? Do I need to register for it in advance? Is there a parking close to the garden? I have an infant with two preschoolers with me 🙂 Thanks! Hope you managed to find us! We are a go for Thursday mornings from 10 am to Noon this summer and yes there is parking at Colborne Lodge around the corner or up at the Grenadier Restaurant. No registration necessary just stop by when you can 🙂 We look forward to seeing you there!